30 Days of Treasure Hunting! – DAY 23 – Jess Granger! My guest today is author Jess Granger! Jess Granger grew up in the middle of the San Joaquin valley in the dead center of California, close enough to visit “cool” too far out in the middle of nowhere to “be cool.” She still loves home and her California farm girl upbringing. Now she lives all over the place as a military spouse. Currently she has landed in Ohio, but who knows what the future will bring. She lives with her hubby, two kids, two cats and an all-American mutt-dog named Jake. When not writing, Jess likes birdwatching, making beer, writing slightly naughty haiku and posting them on Twitter, and growing butterfly gardens. Cyn is a rebel, driven to protect those suffering at the hands of the Elite leaders of Azra. Using his alias to manipulate the lovely but icy commander onto his ship, he has to keep her from Azra long enough to ignite the revolution. But when he awakens a vibrant and feeling woman beneath that hard exterior, he gets more than he bargained for—love. He must find a way to convince Yara to join him, before they get caught in a web of deception that could tear their world apart. 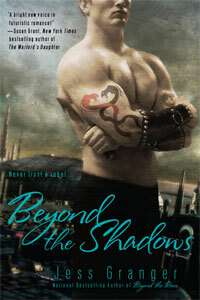 Today Jess is giving away a signed copy of BEYOND THE RAIN. Simply answer this question: What is Tuz? Some of my favorite characters in books are the pets. I’ve had a lot of fun creating fuzzy and sometimes robotic sidekicks for my main characters. Whether they’re serving as comic relief, the heroes in their own right, or troublemakers, I love a good pet. What are the most entertaining pet characters you’ve seen in a book?